Polls have closed in Israel's national elections, with both incumbent Prime Minister Benjamin Netanyahu and his primary challenger, Gen. Benny Gantz, claiming victory, The Times of Israel reported April 9. Initial exit polls, however, indicated a close race. 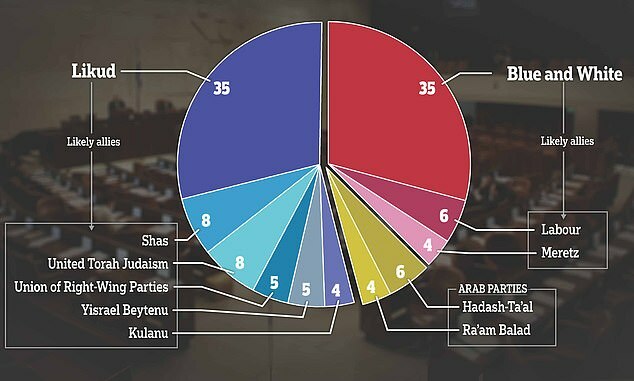 The final vote count will not be finalized until April 11, and it may take additional months to form a new government in Israel's coalition-based political system. Now let's see if he can actually do it. I'm sure they have deep state actors there also. Israel is one of the contenders for being the home of the deepstate. Prime Minister Benjamin Netanyahu has won the Israeli national election, securing a record fifth term in office despite running neck in neck with his challenger Benny Gantz, the country's three main television channels said on Wednesday.With 97 percent of the votes counted, neither of the candidates' parties had captured a ruling majority, but Netanyahu was clearly in a strong position to form a coalition government with other right-wing factions that have backed him. That said, some theories going around suggesting that both Netanyahu and MAGA were funded by same casino owner were quite reckless and US MSM has wisely not covered such controversial reports and memes. MAGA is very wealthy and doesn't need any Foreign-First lobbies money in order to put America-First, doesn't work that way. I knew Bibi was going to win his reelection. The biggest losers on election night were the New Right party, which contains two former senior ministers, and the 'dark horse' Zehut party, run by a pro-cannabis libertarian, who both failed to garner enough votes to enter parliament. Israeli Prime Minister Benjamin Netanyahu continued celebrating his presumed victory as his centrist rival Benny Gantz said he “accepted the decision of the nation” following Tuesday’s general election. Gantz did not call Netanyahu to concede, however. Netanyahu’s Likud party took about the same percentage of the vote as the Blue and White Alliance that backed Gantz. But Likud has enough allies in the Knesset, Israel’s national legislature, that Netanyahu can start forming a coalition government, reported USA Today. Another Blue and White leader, Yair Lapid, promised to “embitter” the lives of Likud politicians until the next election, according to The Jerusalem Post. A final count of election ballots on Thursday granted Prime Minister Benjamin Netanyahu's Likud party an additional seat in parliament, making it the largest faction in the Knesset and punctuating the Israeli leader's victory.The results released by Israel's central election commission showed Likud capturing a total of 36 seats in the 120-seat Knesset, compared to 35 seats for its main rival, the centrist Blue and White party. An earlier count had the two parties deadlocked. Only a big push in the final hours of voting secured the survival of the two primary Arab parties. Still, they saw their representation dip. This is a big win for MAGA's alleged Foreign-Firster political slave masters, as reportedly Bibi "Iraq War will be great" Netanyahu and MAGA are funded by same primo neocon. Last edited by enhanced_deficit; 04-12-2019 at 04:26 PM. Looks like more of the same from the Israeli front, then. How is it that Netanyahu is so popular?